The big, bad dragon that lived in the local treasure-filled dungeon got bored and decided to stretch his wings, leaving heaps of unguarded gold behind. There's only one problem: there are too many Looterz and not enough dough! Fight, steal, and cheat your way to be the richest Looter of them all! 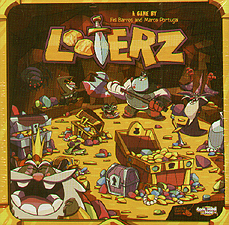 Looterz is a fast-paced and easy to learn card game with incredible art and highly-interactive gameplay. Using a shared deck, players build and unleash combos that help them search the dungeon for gold and hamper the other players' teams!